For the last event this month, InterNations Tokyo takes you to an amazing genuine venue! Only steps away from Roppongi's crossing on Imoaraizaka, WorldStarCafe welcomes you with a beautiful, quiet and relaxing ambience. It represents a dynamic atmosphere fusing the comfort and the casual environment of a genuine European cafe with an exclusive wine bar & a stylish high-energy bar counter. The multi-language drink and food menu we negotiated for our members will leave no wishes unanswered. Please check the venue's homepage for general information. International staff speaks multiple languages, but at least English and Japanese to start with. How to get there: From Roppongi station take exit 3. Turn right at the famous Cafe Almond corner. Go downhill and pass Yahoo mobile shop on the left. 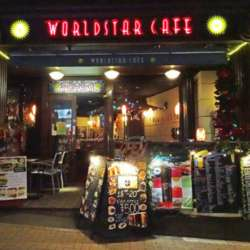 WorldStarCafe is after 50m on the left. This venue is just next to the station. Within 100m from exit 3, slightly hidden away in a sidewalk. Please note: The venue space is exclusive to InterNations members only. So kindly make sure to invite your best friends well in advance and confirm they are signed up to avoid disappointment. This will help to avoid delays at the entrance area as well.